I really enjoyed this article from Notebook magazine (October 2009, pages 132 - 136) on using vintage objects to grow your own herbs and salad. It made me start looking around the yard and the kitchen at otherwise unused objects. It is much better for the environment too, to use items that may be thrown out (who am I kidding, I throw nothing out!). I love the cart in the first image with rosemary, oregano and lavender growing successfully in it. I once read that we should try and buy items that will last. The best example of this is the humble bucket. You can pick up plastic ones at the big hardware stores for around 79c or something ridiculously cheap. But is it really cheap? And at what cost to the environment? I know from my own experience that all plastic buckets eventually crack (even the better examples, the ones that cost around $3). Alternatively, one could buy a tin bucket (new ones probably cost around $18 at a guess). 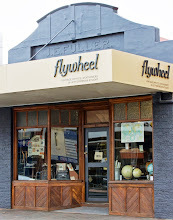 Galvanised tin does not rust and being made of metal should not crack for a very long time. I know what I would prefer to buy and use. 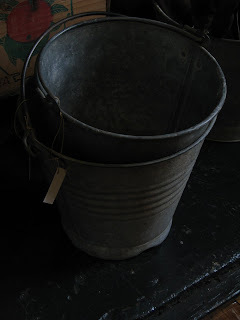 Actually my ideal bucket is vintage tin buckets like the two above in our store (great for a Christmas tree, by the way) as they are heavier than their modern equivalents. For this same reason, I choose to buy very good quality garden tools, especially the old ones (see previous posts from June and October). I have never, ever had an old tool break which means less trips to those big hardware stores. Beautiful images today Tammy. Amazing what can be achieved by thinking outside the square - even just a little bit. I totally agree with you about the old buckets. My parents are dairy farmers and I can remember those old buckets and how very sturdy they were. Certainly, todays buckets are not in the same league! I know I am making myself sound completely ancient, but rest assured that is not the case!!! 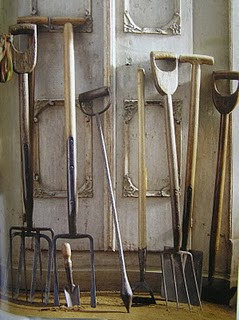 They don't seem to make garden tools like they used to...it's a shame really as it promotes a throw away society. I LOVE having fresh herbs growing in containers - I recently planted basil, parsley, coriander and mint, and (by some miracle) they haven't died yet, hooray! 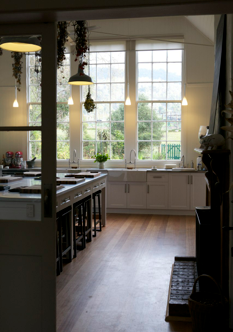 Do you grow your favourite culinary herbs? Speaking of potted herbs, I also bought a pot of lavender today to have next to my bed at night, mmmm. Also, what encouraging news about not ever having had lovely old tools break (and I love that you use them)! Hi Katrina, I grow parlsey, oregano, sage (inc purple sage), thyme and lemon thyme, peppermint, lemon balm, coriander, chives and basil. I think that is it! My marjoram and tarragon died...I may replace (or steal mum's if I need them in cookinig). And I am thinking some dill could be useful for summer (with smoked salmon etc). Having lavender by the bed is a good idea, it would be calming I should think. One of my most useful old tools is a dibber (it pokes holes in the ground for planting seedlings). It also helps to plan the spacing between plants. Happy gardening!